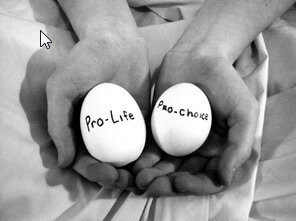 The abortion debate is mixed up and convoluted to the point that it seems it can’t be sorted out, but let’s try. Let’s step back from the edge and consider how it began. For the anti-abortion movement it has always been a moral issue. For the Supreme Court Roe v. Wade was a constitutional question about the limits of government and the privacy rights of women. The question before the court was essentially this: Does government have a right to impose a Christian moral value on individual citizens? Ignore that the “Christian moral value” involved is a belief that life is sacred from its inception and the framework of the question itself is one most conservatives would still accept today. Roe v. Wade was about limiting big government. In this narrow sense, the decision didn’t make abortion legal so much as placing it beyond the reach of politicians to govern. The initial recourse for those who passionately believed that abortion is a sin was to build a consensus for their views across all political and religious lines while condemning the practice in their churches. This was the initial focus of anti-abortion activists. It required acceptance of the ruling while working to alter America’s social norms. This did not remain the focus of the anti-abortion activists for long. It became apparent that changing social norms is a long, uphill battle. A majority of Americans, including majority of Christians, continued to see Roe v. Wade as a question of personal liberty. The result was a growing moral imperative for Christian activists that became too powerful to wait for social change. Accepting that the abortion decisions could be a “legally protected” private choices was too much to bear, so they took a different next step . They began to run for public office. They decided to take matters into their own hands and directly influence the law. This was an unprecedented change in American Politics. It was the beginning of the Christian Conservative movement. It required believers to suspend the separation between church and state. The leap to impose a Christian moral law on a recalcitrant society required developing an ideological view of America as a Christian nation. Secular government became the enemy. This change of strategy was a shock to pro-choice activists and to a majority of citizens alike. It hastened formation of both the pro-choice and pro-life movements and dramatically escalated the polarization of American politics. Establishment Republicans quickly welcomed the Christian Conservative movement and nurtured their development. The Republican party elite somewhat cynically added conservative Christians to their otherwise dwindling political base and adopted family values as wedge issues to win elections. This gave the GOP a new life and a new focus to stay vital. At the same time, the focus of the anti-abortion argument moved from refuting a woman’s right to choose to protecting the rights of the unborn fetus. In effect this extended the inclusiveness and full protections of our constitution from adults to the unborn. This is not a concept considered by our founding fathers who never even attempted to define children’s rights. Fast forward to today and we see a backlash in the Republican party between social conservatives and the GOP establishment who failed to deliver on all the cynical promise made to Christian conservatives in exchange for their votes. Today there is a large contingent of uncompromising Christian right conservatives in Congress who believe their positions on policies are the will of God. A recent Public Policy Polling survey revealed that 44% of the Republicans now believe we should make Christianity the official religion of the United States. So we find ourselves hopelessly deadlocked with a large portion of the population believing abortion is murder in both a religious and legal sense and about half the country still believing it is an issue of personal morality to which government has no business enforcing a different ideology. Holding that the U.S. Constitution confers on a fertilized egg the right to be born may be a legal stretch, but others hold that at some point the fetus becomes viable and constitutional protections may then apply. The remainder of the population still sees a live birth as the point where constitutional protections begin. In effect, we are having two separates debates on the subject. What the constitution intended is one debate and what is morally unacceptable for humanity is the other. The great abortion divide has polarized us like no other issue since slavery. As was true then, the abortion divide has severely damaged our institutions and our ability to self-govern. It has impacted all aspects of our politics and our society. Even our fidelity to the Union and our commitment to majority rule are being tested. How we eventually resolve the abortion issue may be over the horizon right now, but an effort to reconnect with the true nature of our differences would be a good start. It doesn’t help to think of anti-abortion activists as terrorists or of pro-choice activists as murderers. We have to stop talking past each other to achieve a new national consensus on the limits of government and the role of religion in public life. Most certainly that will involve renewed patience and a willingness to accept some degree of compromise on all sides. The alternative to a solution is unthinkable. “Bernie Won All the Focus Groups & Online Polls, So Why Is the Media Saying Hillary Won the Debate? The Time Magazine poll had Bernie winning by 56% with Jim Webb coming in second at 31%. Hillary came in at 11% in their poll. A majority of CNN’s own focus group felt Bernie Sanders won the debate. On Fox News, the Frank Luntz focus group in Florida unanimously felt Bernie won the debate. Half the group of 28 Democrats supported Hillary at the start of the debate and less than half of those supporters continued to support her after the debate. On Twitter Bernie was mentioned 407,000 times, the most of any candidate. His name was mentioned in 12,000 tweets per minute compared to Hillary’s 8,300 tweets per minute. A content analysis of tweets for Bernie and Hillary showed that 69% of his tweets were positive compared to 56% positive for Hillary. 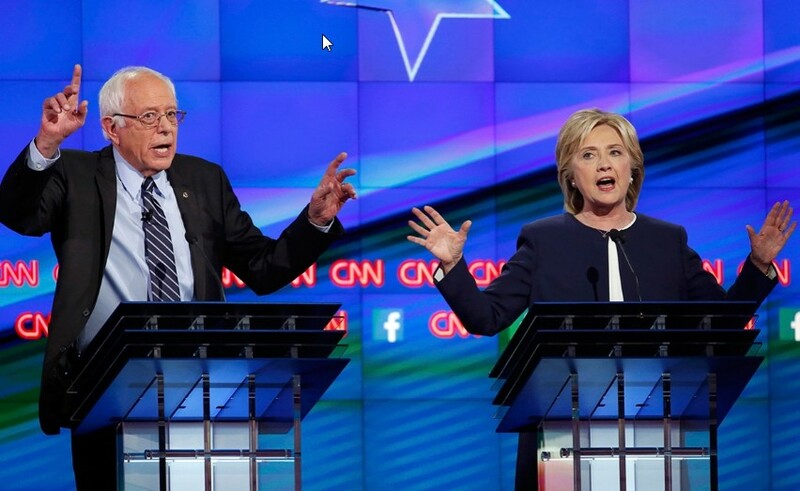 During the debate people Googled Bernie Sanders twice as often as Hillary Clinton. On Facebook, Bernie attracted 24,000 new followers to Hillary’s 7,700 new followers. On Twitter Bernie attracted 42,730 new followers to Hillary’s 25,000 new followers. So what were the corporate media newspaper headlines the day after the debate? I listened to Chris Matthews on MSNBC extolling the way Hillary dominated the debate during his show that immediately followed it. The next day, on his own show, he expressed real doubt about who won. He said that on the night of the debate he was listening to what the producers were saying in his ear. Wow! It is not an independent and neutral party in American politics. It serves the for profit interests of its owners and its advertizing clients. It takes an active hand in shaping public opinion and framing our public debates. It is responsible for the rise in political polarization and the sharp divisions we have experienced in recent decades. It is responsible for the unhinging of the Republican Party and the entertaining, carnival like atmosphere that characterizes it today. The Citizen’s United Supreme Court decision was a windfall for the main stream media. All that money pouring into political PAC’s from anonymous wealthy donors ends up in the media’s pocket. The have every incentive to grab as much of it as they can and very little incentive to remain faithful to their journalistic mission. “Many of the issues Sanders holds, such as the need to break up big banks and tax billionaires to pay for free college tuition, hurt the financial interests of the mainstream media’s biggest corporate clients. This creates a conflict of interest for the corporate owned media. Covering the Sanders campaign on his terms forces them to report on issues that don’t serve the financial interests of their advertisers. And then, when it was clear to viewers that Bernie Sanders has something important to say that doesn’t fit the establishments narrative, main stream media outlets simply pivot and declare their preferred candidate the winner. Every instance of drug use is also a transaction between the users and the suppliers, whether the supplier is a dealer, a friend trying to be helpful or a parent that leaves prescription pills in easy reach. On the user side of the transaction the decision to partake always meets some need or desire need. How strong the need or desire to take a drug is a variable, and therefore potentially controllable. It is important to understand what needs are being met when a young person decides to partake in drugs or alcohol. The lists below are among some frequent motivators that lead to drug transaction and drug use. Each of these factors can be modulated by family or community interventions. Still, this is just one side of the transaction. On the other side is the availability and cost of the product being consumed and the economic pressures on the supply side of the equation. Just like any transaction, the lower the price or available the product the more likely a transaction will occur. Factors affecting price and availability includes not just law enforcement interdiction but market factors in the legal and illegal drug trade, the strength of a profit motive for individual dealers, the pain management and prescribing practices of doctors, the economic pressures of small business owners selling cigarettes or alcohol to minors, the amount of peer pressure being applied to sell or give drugs to others, the vigilance of parents in keeping products in the home out of the reach of their children, etc. Primary prevention is all the things we can do as families and a society to forestall or eliminate an individual’s preliminary exposure to addictive substances. It is the efforts undertaken to eliminate the various needs (or demands) that initiate drug transactions in the first place. The following is a collection of ideas on the topic from a variety of sources with the URL links to some of the material and my own thoughts provided in the bracketed text. My purpose is to initiate or support public dialogue about what can be done to fix our drug problems. Let me begin with some ideas as to why children try drugs in the first place. People suffering from anxiety, bipolar disorder, depression or other mental illnesses use drugs and alcohol to ease their suffering. People figure if a drug is prescribed by a doctor, it must be ok.
[Here is where doctor’s and the whole medical profession needs to rethink their approach to pharmaceuticals in general and pain management and mental illness treatment specifically. Pharmacies need to keep better records that are regionally integrated with other pharmacies in order to identify suspicious patters of certain classes of prescription drug sales. Doctor’s and medical staff need better training in identifying not just the symptoms of drug addiction in patients, but in identifying patients who may be at risk before prescribing potentially addictive drugs. People think drugs will help them fit in. People chase the high they once experienced. Prevention is most promising when it is directed at impressionable youngsters. 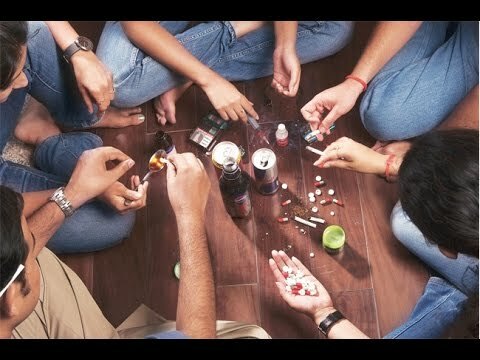 Adolescents are most susceptible to the allure of illicit drugs. Delaying or preventing the first use of illegal drugs, alcohol, and tobacco is essential. Evidence from controlled studies, national cross-site evaluations, and CSAP grantee evaluations demonstrates that prevention programs work. Prevention programs are not vaccinations that inoculate children against substance abuse. Sadly, significant numbers of young people who participate in the best programs will go on to use drugs. The “no-use” message must be reinforced consistently by parents, teachers, clergy, coaches, mentors, and other care givers. While all parents are critical influencers of children, parents of children aged eight to twelve are especially influential. Children in this age group normally condemn drug use. Such attitudes and attendant behavior are easily reinforced by involved parents. Parents who wait to guide their children away from drugs until older ages when youngsters are more readily influenced by peers or may have started using alcohol, tobacco, and other drugs, decrease their ability to positively influence children.